The Tories are doing great in the polls, but their coalition is more fragile than it looks. If the polls are borne out in the coming snap election, the Conservative Party will have a level of support not seen since 1979. The combined right-wing vote would be the biggest since the thirties. Since the early 1990s, the Conservative Party has been trapped at a vote level of between 30 and 36 percent. Under Theresa May’s leadership, the party has been polling in the low 40s. Since the snap election was announced, it’s surged to between 46 and 50 percent, though there are now signs that it may be falling back. Theresa May, whom headlines loudly declare is the most popular prime minister in decades, is conducting a hermitic and increasingly erratic campaign. Dodging televised leadership debates, she also appears only in small, tightly controlled public gatherings where no questions are asked. She delivers scripted speeches and repartee in contrived contexts, such as Prime Ministers Questions, or in short media interviews, but otherwise is withdrawn. This suggests that at least some of her “popularity” is based on the fact that, by avoiding too much exposure, she is able to attract a variety of projections. 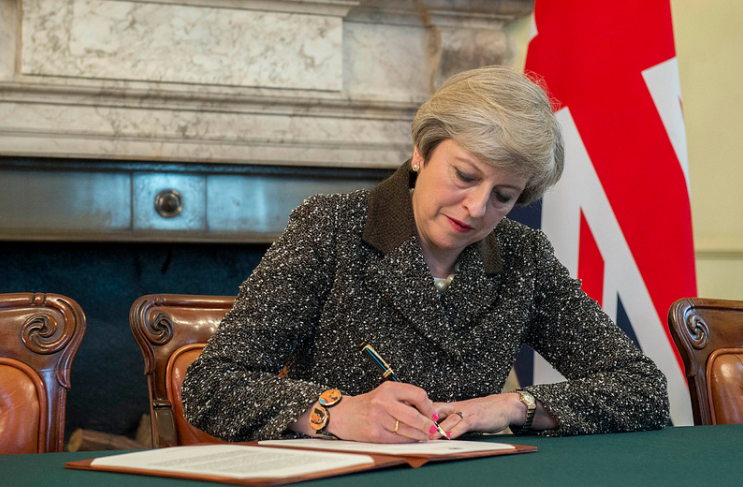 For traditional Tory voters, she occupies Thatcher’s fantasy role as a strict, matronly English headmistress; for others, she is an effective administrator with a history of centrist pragmatism; for the Telegraph, she wears rather fetching shoes. In this context, and left unchallenged, May’s evasiveness can be presented as a kind of classy inaccessibility. With a characteristically servile media, an opposition tearing itself to pieces, and a Brexit vote seemingly reunifying the divided camps of the Right, this election looks set to be a rout. This would represent a remarkable turnaround in the Conservative Party’s fortunes, after a long period of thwarted “modernization” and only meager recovery from a deep crisis. It would, with horrendous social costs accumulating at the bottom, appear to restore the Tories to a traditionally dominant position in the British state. But things are much more fragile than they appear. This was a circumstance heavy with irony. That the Tories, the party of Britain’s aristocracy and big capital, the party of austerity and the City of London, should peak during capitalism’s greatest economic crisis, was extraordinary. Particularly since, as the Baldwin administration’s reluctant concession of reforms had demonstrated, the working class was largely shifting to the left. But capitalist crisis had wrought its worst damage on the Labour Party. The ineffectual first Labour administrations had essentially preserved the given order while, at least until the financial crash of 1929, channeling some of the proceeds of capitalist growth to ends of moderate social reform. When growth no longer availed, they had no alternative vision by which to avert the austerity recommended by all orthodox economists and the City. Unable to guarantee the support of Labour MPs for this policy, Labour leader Ramsay McDonald and his allies split from the party in order to join a Conservative-led National Government. In so doing, they helped rebuild nationwide support for the Tories, while leaving Labour in a greatly weakened state, briefly under the leadership of the left-winger, George Lansbury. Aside from the feebleness of the opposition, the Conservatives were attentive to their social base, particularly the middle class and a layer of skilled workers. While austerian capitalism deeply hurt the poor, there were just enough protections and incentives for those in the middle to secure their loyalty. The tides shifted before long, with the war against fascism, and the experience of collective sacrifice, producing the widespread radicalization which culminated in a massive postwar Labour mandate. The war also disoriented and weakened the capitalist class enough that it was more than usual dependent on the organizing role of the state, while also destroying enough surplus capital to enable renewed growth and fund a generous expansion of welfare and public services. There are many parallels there with today’s situation. In particular, it is social democracy (in its neoliberal format) which has been thrown into crisis by the credit crunch and ensuing austerity politics. No systematic alternative to austerity was supported by the major political parties. New Labour’s growth-predicated governing agenda all but collapsed. So it is the Conservative Party which has been able to organize a governing coalition and shape the popular narrative as to the cause and cure of crisis. With austerity measures carefully targeted at selected groups of demonized welfare recipients and public-sector workers, the Conservative government also protected homeowners and paid for middle-class tax cuts with reduced social spending. This capitalist crisis was also managed by employers in such a way as to avoid mass layoffs — the better to keep on trained staff in anticipation of renewed growth — with the preferred tactic being wage cuts and underemployment. The biggest losers from this austerian phase of capitalism have radicalized, but they are a largely disorganized minority. It’s easy to think it would take something equivalent to a species-threatening world war to make Labour great again. The differences between the 1930s and the 2010s are at least as important as the similarities, however. In the first instance, the Conservative Party of the thirties was coming to the zenith of a long phase of electoral growth for the party, begun under Benjamin Disraeli in the 1870s. Deploying a combination of imperialist nationalism, Protestant chauvinism, and moderate social reform (such as on housing and sanitation), the party had successfully adapted to the expansion of the electoral franchise to the working class. Especially small-town and rural working-class electors joined the Conservative base. The “Orange card” linked Tory Lords, benefiting from estates in Ireland, with anti-Catholic working-class voters. The Tories also secured a mass, though largely passive, middle-class membership to publicize and knock doors for the cause. Organizations like the Primrose League propagated Tory ideology. And with the rise of the Labour Party and a growing trade-union movement, the Conservatives had commandeered an expanded bloc of antisocialist voters — a bloc then greatly expanded by Labour collapse in the Great Depression. By the time Theresa May took the reins, however, the Conservatives had gained office twice with just over a third of the vote under a center-seeking leadership. This was only a mild improvement on previous performances under a series of Thatcherite, Euroskeptic leaders, all of whom had gone down to defeat. David Cameron’s modernizing leadership had detoxified the Conservative brand for a small middling layer of “secular”-minded swing voters in 2010, who cared more for their wallets and stability than for wider Tory ideology. This gave the party a plurality, but not enough to govern by itself. By 2015, coalition with the Liberals and a cautious austerity agenda had lost more right-wing votes, but reassured plenty of affluent southern centrists, giving Cameron just enough votes in just the right places to form a majority government. But this was something of a lame duck with a small majority, and Cameron had bet on a Brexit referendum to finally put an end to constant kamikaze attacks from his own restless backbenchers. The loss of faith among the Tory base was cruelly demonstrated when they swung hard behind Brexit, despite the leadership’s opposition. This brings us to the other major differentiating factor — the existence of a big, right-of-Tory party which worked aggressively to polarize politics to the right. The UK Independence Party (UKIP) represented an eccentric split away by the most belligerent anti-European Tories, hyperglobalizers and Little Englanders, when it was first founded. By the 2010s, it had become a significant hard-right party, with a particular emphasis on baiting immigrants. In the context of austerity, and with a near-vacuum on the Left, UKIP was able to blame the social costs of crisis, and decline in large parts of the country, on migration made possible by the European Union. UKIP, rather than Cameron’s Conservatives, was the dynamic factor in the 2015 election, racking up almost four million votes on a right-wing “anti-establishment” basis and setting the agenda for other parties to follow. Labour’s pathetic “controls on immigration” election mug was its effort to triangulate the growing anti-migrant animus. Its current “truce” on immigration, amounting to a consensus that free movement of labor within Europe is finished, shows that these triangulating tendencies are alive and well. UKIP still sets the agenda. Europe, especially since the 1992 Exchange Rate Mechanism crisis, had been the Conservative Party’s Achilles heel, with a right-wing base divided over membership of the single market, and the prospective membership of the currency union, and preventing the Tories from assembling a viable electoral bloc. Brexit, representing a decisive victory for the hard right, has fundamentally reorganized the political terrain. With Theresa May adopting UKIP rhetoric, promising a “red, white and blue” Brexit, former UKIP voters have started to return to the Conservative fold. UKIP, having failed to make any major breakthroughs since the result, and having suffered high-profile losses, including the departure of its only MP, Douglas Carswell, now looks set to run a purely symbolic campaign emphasizing Islamophobic thematics. Whatever votes it does receive will not translate into real influence, let alone representation. Insofar as it set out to drive parliamentary politics to the right and break the dominance of a business-led center, it has achieved its goal. The Tory recovery is its fruit. While the specter of a resurgent blue beast is genuinely frightening, however, the deep fragility of this recovery should not be missed. Tory support seems to be broader than it is deep. The party’s membership had peaked at three million in the postwar era and was still close to a million prior to 1992. It has never recovered its subsequent, plunging losses, and is less than 150,000 today. Modernization of the party’s structures, intended to draw in masses of new members on a largely passive basis, has been ineffectual. A big part of the Tory vote surge is driven by Brexit, but this is before the consequences of the vote have begun to filter through to the different class bases of the Conservative electorate. Just as importantly, the relative share of the Tory vote depends in part on a long-term collapse in turnout, which disproportionately appears among younger and poorer voters less likely to back the Conservatives. For a long time, there has been a race to the bottom between Labour and the Tories over whose crisis is worse — with the party in the least-worst state generally able to take office. But while Labour’s crisis is currently worse, the long-term demographic tendencies suggest that the Tory base will continue to decline, and that the rise of authoritarian and racist nationalism among older voters will not be a sustainable basis for revenant Toryism. Above all, May has staked her electoral claim on a return to the party’s traditional role as the “natural party of government” — the idea that it is particularly adept at statecraft. This appearance of competence, currently compromised by May’s extraordinarily gauche, unimpressive pre-negotiations with EU leaders, is accentuated by the demoralizing mess that the main opposition party is in, with the leader struggling to mold the party’s position, having constantly to negotiate with enemies, and embattled by his own backbenchers and senior figures trying to throw the election. A unified opposition, even one promoting the broadly left social-democratic agenda of Jeremy Corbyn, may not have been able to prevent the Tories from cashing in from Brexit, but it could have prevented disaster: the post-Brexit “chicken coup” was a gift to Theresa May, which she has gratefully accepted. In short, a great deal of May’s current advantage is down to a failure of political agency — that of the Labour Party, and particularly its traditional management. Nor is there much stability in the current climate, or apparent room for a large center-ground. The post-Brexit Tory vote is contradictory. The economically nationalist petty bourgeois voter has little in common with the affluent swing voters currently favoring May against Labour or the discredited Liberals. The business and financial class condensed in the Tory leadership is remote from the concerns of grassroots Conservatives. Such broad coalitions forged in these moments of crisis can last, but only if the political and economic situation begins to stabilize. With global growth still weak, and no major new vectors of capitalist development in sight, and with Brexit threatening to be a punishing experience, only a fool would bet on the Tories reconstituting themselves for the long haul. New divisions on the Right are likely to emerge in the medium term. This is a snap election for a reason — the moment of outright Tory dominance is liable to prove fleeting. May, though surprisingly inept in some ways, sees the quarry slipping away, and is grabbing it as fast as she can.